Getting there is half the fun. 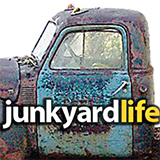 Junkyard Life guys – hearts of gamblers with none of the instincts. That’s us! 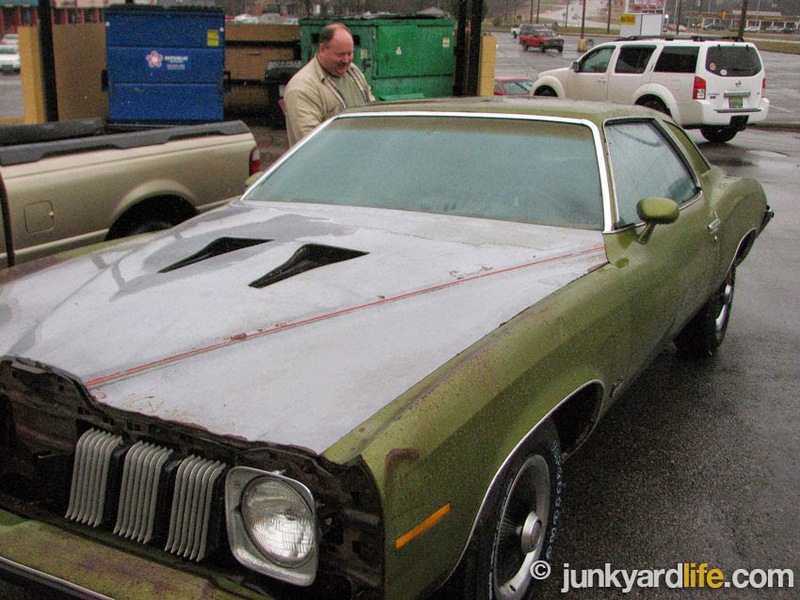 An ongoing obsession with 1973 Pontiacs is taking place at Junkyard Life. 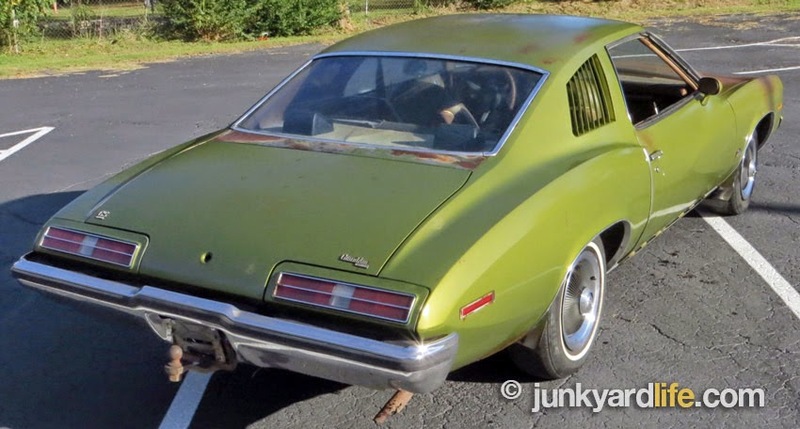 We have never seen a green 1973 Grand Am. So, having one became mandatory. We obtained possibly the coolest of Colonnades... a 1973 Pontiac Grand Am. In a rare color called "Golden Olive." A little background on "Olive," as we have named her. She is a shapely 1973 Pontiac Grand Am in mostly original condition. Her drive train operates nicely, though she does have a dead leg rear end. 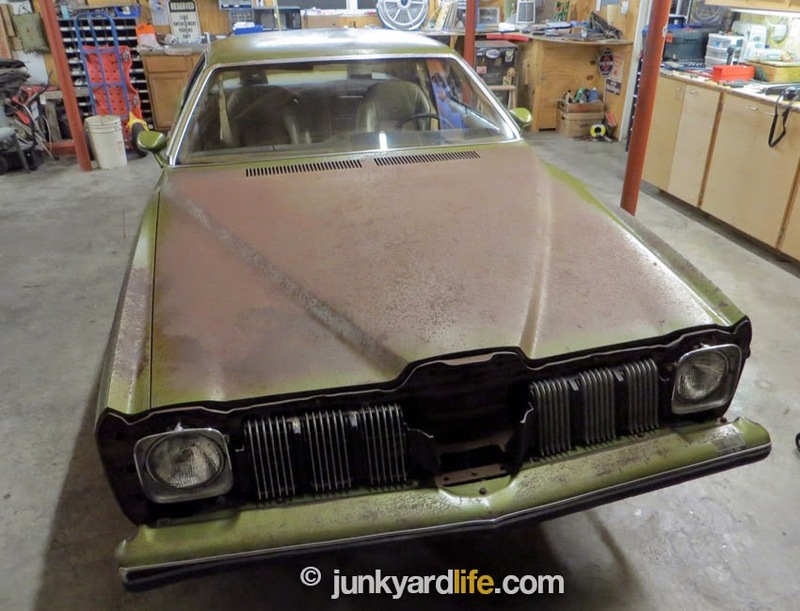 A NACA hood (added by us, soon after purchase), and several other tasty Grand Am things like a rear sway bar and reclining "horse collar" seats will earn her a permanent parking spot in the Junkyard Life stable. Olive has a bit of a smoking problem from her 400 engine, fed by a 2-barrel carburetor, but we are convincing her to quit. We have big engine plans in the near future... More, more, more! She has the finned hubcaps that Pontiac purest hold so dear. The GM A-body drives great, stops true, and feels tighter than a 42-year-old car should. But was Olive up for a trip to T.S.U.S.F. (Top Secret Undisclosed Storage Facility)? Dare we? The rain had no intention of letting up and we needed to put the car inside, right? Okay, lets go. 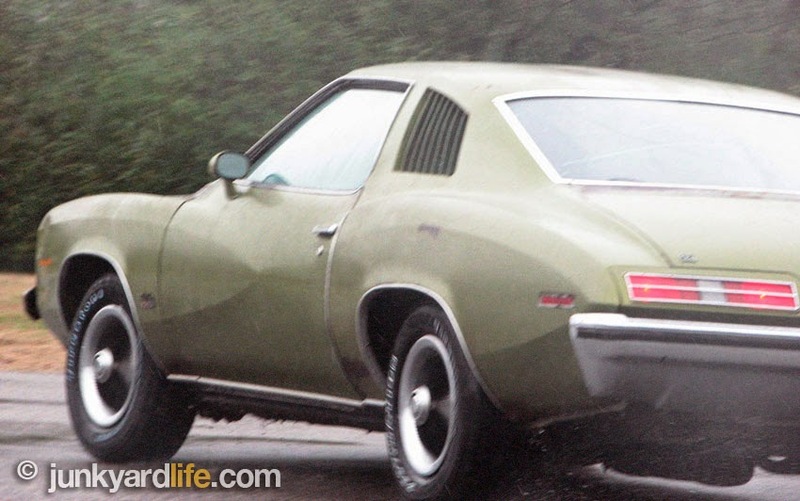 Keith Lively takes the shotgun seat in the ’73 Grand Am adventure. Miss Olive needs a nose job but the NACA hood addition was a must. 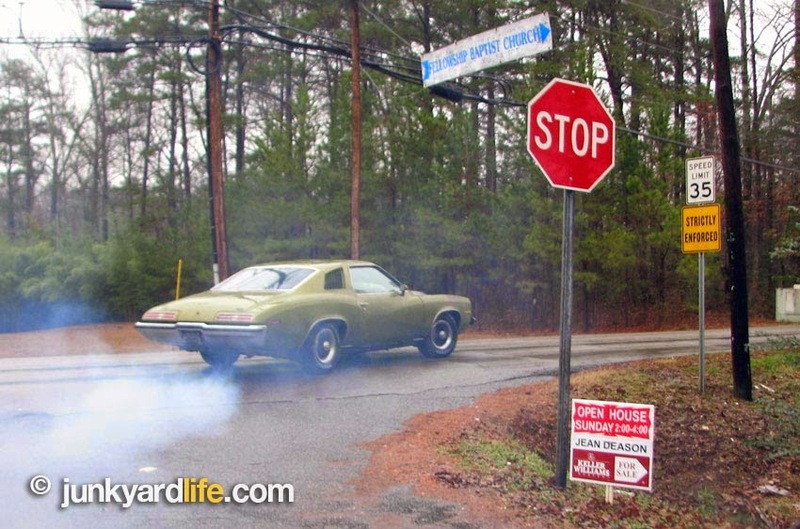 We called a Junkyard Life brother, or two, to ride along (and "push” if needed). What could go wrong? For added safety, we decided to follow along in an even older car! 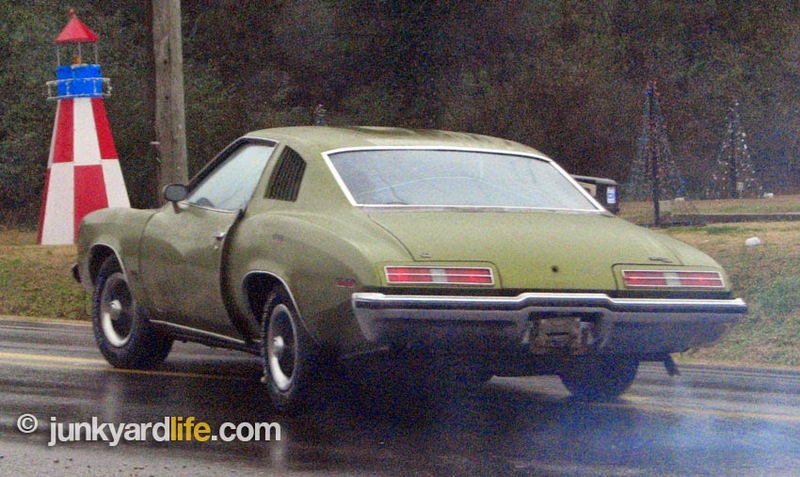 Somehow, Junkyard Life brother, Keith Lively fell for this malarkey and rode shotgun. I wish we could say that was tire smoke. That 35 MPH limit won't be a problem. Yes, you guessed it, I met up with the guys and, wow... What a car, and what an adventure, and what was I thinking? A normal person would have just put it on a trailer and made the trip. Not these guys. After some debating, it was decided to see if the Grand Am would run and make the trip under its own power. I was voted co-pilot on this adventure mission. This picture was taken as a door decided it was not going stay shut. We thought Keith was making a break for it. We get the car started and (kinda) running. The old 400-V8 might have six working cylinders, and none of the dash worked. Also, no defroster during what was going to be a heavy rain and an hour-long drive with little-to-no window seals. Believe it or not, the trip started out OK. After 20 minutes of driving in heavy rain, we had to pull into a gas station. YES, WE HAD to DRAIN THE FLOORS THAT WERE FULL OF WATER to keep our feet from going under. Keith wasn't kidding about the fog. Thirty-five minutes into the drive and the Grand Am lost what little power it had, so over into the emergency lane we go. After a few minutes it came back to life and we were moving again. Tail pipes billowing smoke and exhaust fumes starting to buildup inside the Grand Am. The windows are rolled down (yes, still raining) and I can't see a thing. My driver assures me we are getting close to the Top Secret Undisclosed Storage Facility, which sounds to me a bit like the Bat Cave. By now, I'm thinking we just might make it. With only 10 minutes left until we reached our destination, we had to go up a hill. That is when we found out the car must have a bad gas leak, because we are running out of gas when we go uphill. So, with two guys rocking the car back-and-forth, trying to get it to pick up enough fuel to make the last hill, we make it to the top. Victory is ours! 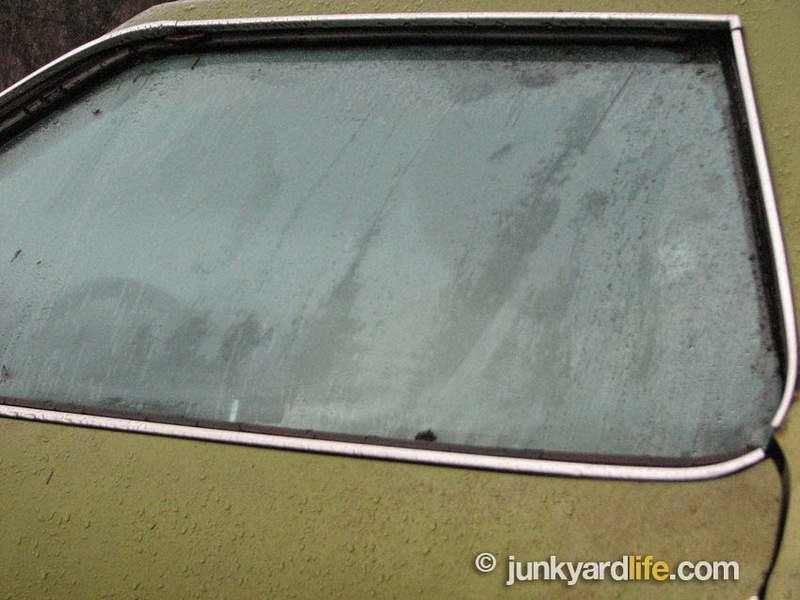 The chase rig, a green 1972 Vista Cruiser Wagon, loaded with tools, is hard to see through the smoke. We pull up to what looks like the longest building ever built. The door opens and with what little headlights we have left, I was not able to see the end on the building. We drive down the main lane to the rear of the building and see rows of really cool, old Hot Rods waiting to be rebuilt and brought back to life. Pilot, Anthony Powell, and co-pilot, Keith Lively test the limits of the new Firestone tires on the Grand Am. New rubber rocks! We made it! Keith wasn't kidding about the smoke either. We shall drop something roller-cammed in this one soon – stay tuned! 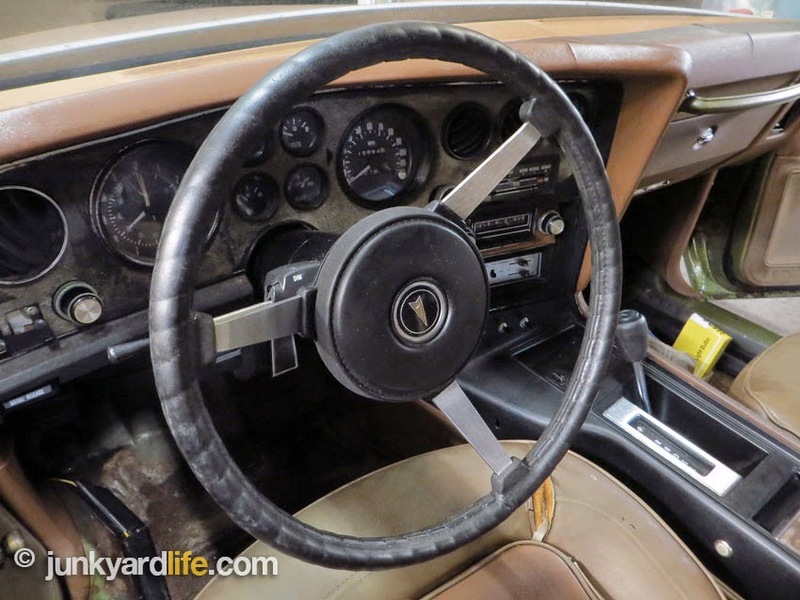 The ’73 Grand Am had no working electrical, except the engine. No defrost, and every window leaked heavily. The engine kept trying to die, and we had to stop and drain the water from the floors to keep our feet somewhat dry, but we made it. Overall, it was a fun trip with a bunch of great friends. I can’t wait to rescue the next barn find and start the next Junkyard Life adventure. One-year-only 1973 Grand Am trunk lid. Tag/fuel filler door moves above bumper in 1974. Pontiac designers continued to offer the buying public beautiful, mid-sized cars even with the government said not to. Bless ‘em. 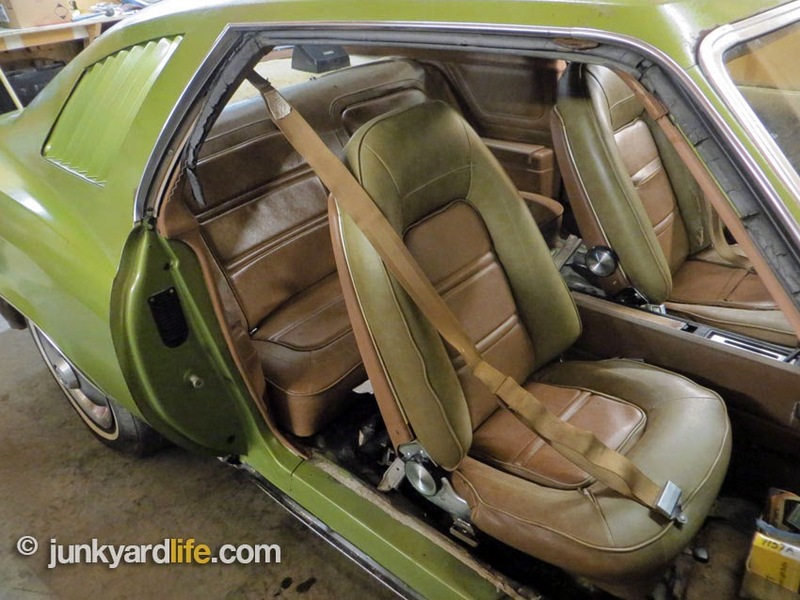 Those reclining Strato bucket seats are a 1973 Grand Am feature. Pontiac Grand Prix and the Trans Am/Formula offered the same seats but without the recline or lumbar support feature. Miss Olive has a complex nervous (wiring) system. Previous owner added several toggles on the console, more accessory switches on the dash, air horns, and an apparent alarm system under the hood. 42-year-old, Miss Olive, shows off her curves. 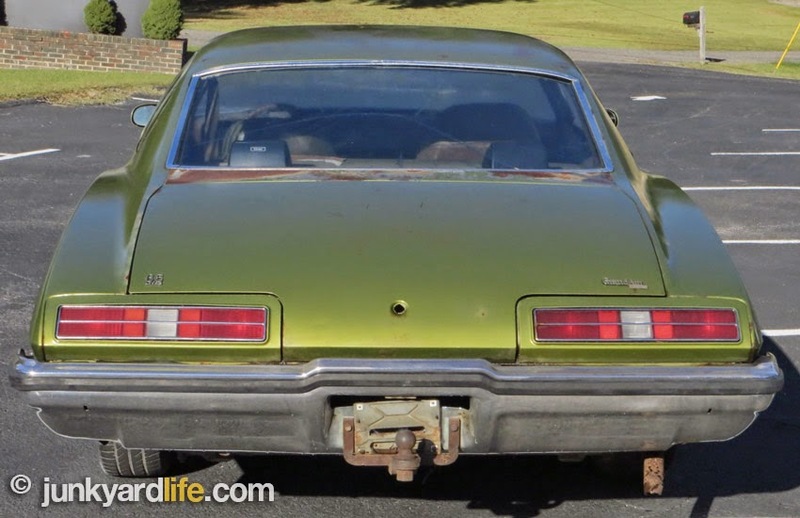 First generation Grand Ams (1973-1975) were GM’s new breed of luxury, performance, and handling, built to compete with European corner carvers. Miss Olive deserves proper cosmetic dentistry and the best rhinoplasty available. A fiberglass version of the soft Endura nose may do the trick.